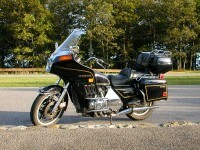 The mechanical speedometer on Goldwings is driven from the front wheel. The speedometer hub links into the wheel hub, and turns as the wheel turns. The speedometer cable connects to this hub. 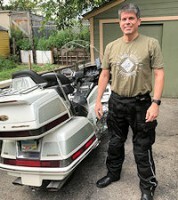 (Goldwings with digital electronic speed readout do not use a speedometer cable, and instead have an electronic sensor at the hub) The core of the speedometer cable is rotated by the hub as the wheel turns. The other end of the cable is connected to the speedometer, where it turns a set of magnets inside. These magnets attract another magnet that is connected to the speedometer needle. As the first magnets rotate, they pull the needle along, indicating the speed of the motorcycle. The speedometer cable continually flexes as it rotates, wherever the cable bends. For this reason, after a number of years and miles, it will eventually break. When this happens, your speedometer will read zero, no matter what speed you are travelling. Replacing it is quite simple, and only takes a few minutes! 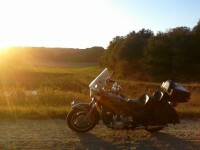 Replacement speedometer cables can be found everywhere - online vendors such as Goldwing Cycle Parts sell them for around $15. This is a part that is subjected to continuous wear, so you really do want a new one, not a used one from a breaker bike. 1. Remove the set screw on the speedometer hub. This screw locks the cable into the hub. 2. On the back of the speedometer itself, you'll find this knurled fitting. Unscrew it from the back of the speedometer. 3. Remove the screw holding the speedometer cable and front left brake line to the fender. Careful - there is a tiny, easily lost nut on the back side that this screw screws into! Pull the speedometer cable free from the fitting. Observe the routing of the speedometer cable through the fairing, then pull the old cable out of the motorcycle. 4. The new cable has a triangular shape to the inner cable at the speedometer end of the cable. 5. Before installing the cable, it should be lubricated. The absolute best lubricant to use is graphite. It sprays in with a solvent carrier. This carrier quickly evaporates, leaving a dry coat of graphite behind, which is an excellent dry lubricant. Caution - this lubricant sprays on - and permanently marks - like black spray paint, so be careful where it drips! 6. Insert the tube from the graphite lubricant into the top of the cable, and very gently spray the lubricant into the cable. 7. When the lubricant starts dripping out the bottom of the cable (onto a strategically placed shop towel, as in this picture), the cable is lubricated. Turn the inside of the cable a few times to make sure it is equally distributed, and let it sit for a few minutes to dry. 8. Thread the cable back into place through the fairing. Make sure it goes through the wire stay, which holds it away from the brake hardware. 9. Gently insert the cable into the speedometer, and tighten in place. 10. Insert the hub end of the cable into the hub. If it doesn't go in all the way gently, pull it out, rotate the inside slightly, then reinsert. Tighten the set screw. 11. Refasten the speedometer cable and brake line into the fender stay, and tighten the screw. This was helpful in knowing what type of lubricant to use and how to disconnect. I had a screeching coming from my speedometer and had become increasingly loud and constant. I searched within the site and read this article. Figured the cable needed lubricating, I followed the steps and voila; the screeching has stopped and all seems to be better. 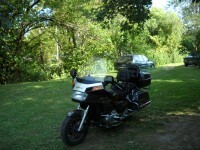 Thx for the info, these how to articles have been great in keeping my 82 Goldwing running with the best. My set screw on the speedometer hub is frozen and I am beginning to strip the phillips head on the screw. I've tried penetrating oil and gently heating the screw. Nothing has worked. Ideas? Got the stripped screw. Bought a $7 screw extractor from Ace Hardware and backed it right out. Got the new cable installed but the speedo doesnt work. It seems to be seated on the bottom end. Cant tell if it is going far enough up inside the speedometer at the top end, but it seems to go in a half to 3/4 inch. Don't know what else to do. montgomery63 wrote: My set screw on the speedometer hub is frozen and I am beginning to strip the phillips head on the screw. I've tried penetrating oil and gently heating the screw. Nothing has worked. Ideas? I had the exact same problem. I ended up using an impact driver (no, not a pneumatic one) - it's a screwdriver that you hit on the head with a hammer, and as it gets pressed into the screw head by the impact, it twists the screw. One whack, and it popped the screw right out. I got it from PartsnMore. montgomery63 wrote: Got the stripped screw. Bought a $7 screw extractor from Ace Hardware and backed it right out. Got the new cable installed but the speedo doesnt work. It seems to be seated on the bottom end. Cant tell if it is going far enough up inside the speedometer at the top end, but it seems to go in a half to 3/4 inch. Don't know what else to do. Did you make sure it was seated into the drive? If you unscrew it from the speedo, and watch the end while turning the front wheel, can you see the inner core turning? Yes, I did that, and it was not turning. It sure felt seated, so I pulled the other end from the speedometer drive and spun the wheel. The internal pin in the speedo drive was not turning consistently (would for a second, then would stop). I now believe I have isolated the problem as a bad speedometer drive. Yes, I would definitely agree with that. Does anyone know a source for a speedometer drive unit for an 82 GL 1100? I am not finding one online. Thanks. montgomery63 wrote: Does anyone know a source for a speedometer drive unit for an 82 GL 1100? I am not finding one online. Thanks. The same drive (part 44800-425-013) was used on all years of GL1100, so one from any year will work. You have to make sure that you seat it properly. I just did this for my bike and found that the seat end has a slot and groove that must be lined up to properly seat. Britanicus wrote: You have to make sure that you seat it properly. I just did this for my bike and found that the seat end has a slot and groove that must be lined up to properly seat. Yes, all the (mechanical) speedometer Goldwings are like this. The wheel end of the cable has a flat piece that needs to be fit into a slot in the speedometer hub on the wheel. Don't force it - it should fit very easily. If it doesn't fit, rotate the wheel slowly until the slot lines up, and it will slide right in. The top end of the cable is square, and similarly must be in the correct position to fit into the speedometer. If it doesn't fit easily, rotate the front wheel until it does. so how do i change the speedometer hub. 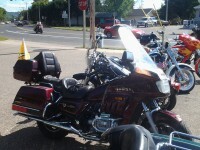 do i have to take off the tire..
bassmaster42 wrote: so how do i change the speedometer hub. do i have to take off the tire..
so i see, to just take off pinch nuts and bolts on the cable side.. not the break caliper? so if i lift up the bike will that give me enough room to get the hub off without the other side not lossen or off? bassmaster42 wrote: so i see, to just take off pinch nuts and bolts on the cable side.. not the break caliper? so if i lift up the bike will that give me enough room to get the hub off without the other side not lossen or off? No, the brake caliper has to come off, as shown earlier in that process. There isn't clearance for the wheel to drop down like that without removing the caliper. You aren't going to be able to drop just one side of the wheel - the other side will hold the axle tightly in place, so you need to remove the axle holder on both sides. just found out the hub is good. i hooked up new cable to tire and after turning the tire the cable moved. yeah.. but how do i get the cable off the speedometer. is there something i have to take off to get to it. i can see it but can get hands on it to turn it off?? Kinda skipped over how to get to the back of speedometer. What is the best way to get at it on a '86 1200 Interstate? Remove windshield ? Does it come out from the front? Remove Fairing? I just can't see how to do it. Thanks for all the advice you give!! It has a knurled collar that turns holding the cable to the back of the speedometer. Loosen the knurled collar and the cable will come out. Sometimes (if you're lucky) you can get it to loosen by turning the whole cable (once it has been disconnected from the wheel hub). how do ya get to it to take it off the speedo ?